Are you ready for a broccoli dish that is going to blow your mind?? Yup, I said it, BLOW YOUR MIND! And I say that with complete confidence. Jackie and I held a workshop last night all about eating and living to increase the energy in your life. It was perfect! We shared the evening with a beautiful group of women. We spoke about different sources of energy, all shared our personal experiences and struggles around it, and most importantly, enjoyed an energy-filled meal together. Our new recipe, ready to be enjoyed! When Jackie and I were in the planning stages of this workshop, we wanted to incorporate some new recipes. We knew that we wanted to do a veggie as a side dish, and ideally, we wanted it to be raw. Well, when we eat veggies (and fruit, and nuts, and seeds, and grains, etc…) in their raw form, we are getting all of the awesome enzymes that would otherwise be killed in the cooking process (they are heat sensitive). Enzymes are amazing; if you don’t love them already, hopefully this will help. Enzymes are responsible for doing all of the hard work inside your body to keep it up and running. Some of these functions include digestion, healing, detoxification, repair, building blood and tissue, supporting brain function, creating cell growth, reproduction… I can go on, but you get it, right? 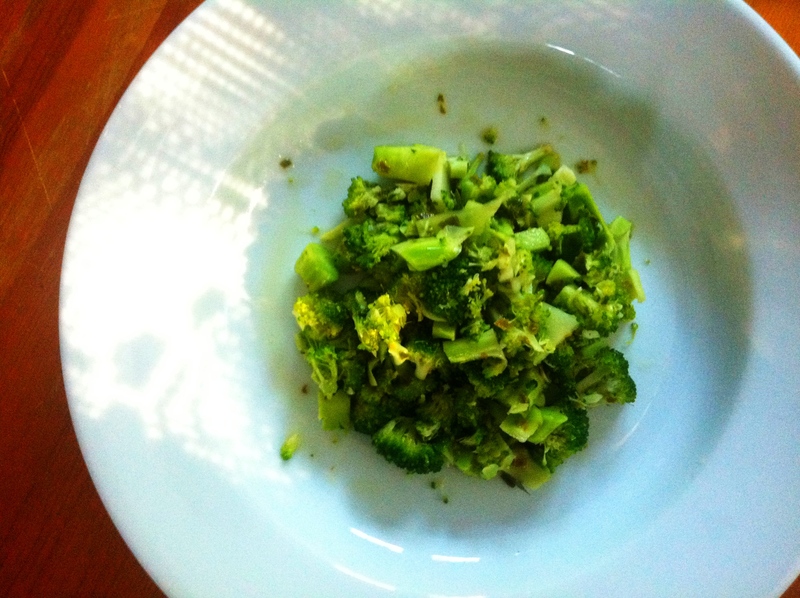 Back to last night… Jackie and I decided that we were going to marinate raw broccoli, and then get some feedback. Broccoli is a great source of calcium, vitamins A and C, folic acid and fiber. And when it’s served raw? You guessed it… It’s offering us all of those awesome enzymes that I just explained. Jackie and I were so excited/nervous about what everyone was going to say… and they LOVED IT! And so did we! Combine olive oil, lemon juice, garlic and salt in a bowl and mix well. Add chopped broccoli and basil, and stir to combine with dressing. Let everything sit for an hour before serving. And that’s it! You can make a whole batch of this, keep it in your fridge, and include a scoop with lunch or dinner until you run out. The idea of eating raw foods may seem intimidating at first, but don’t stress! Begin by paying attention to the amount of raw foods in your diet, and try adding some in with every meal. Maybe some fresh berries with breakfast, a salad with lunch, and this awesome broccoli dish with dinner. And as always, let me know what you think!! Tags: broccoli, raw. Bookmark the permalink.